That Madonna is a cunning wee lass. Changes her appearance like a minx and in similar style Like A Version takes a gander at other pop artists, re-imagining major pop icons in equally grandiose ways. 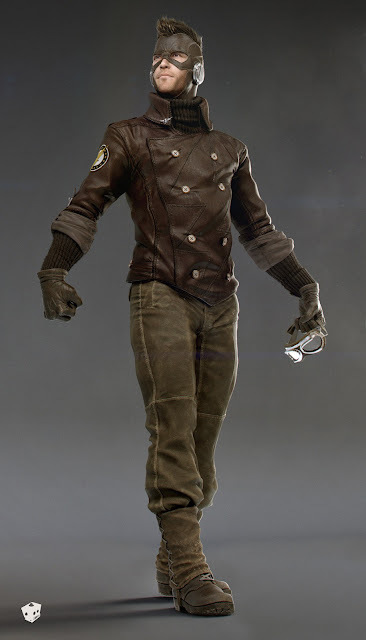 This time round, it's the turn of Chris Brand to recreate what DC's scarlet speedster The Flash would look like, if he was a 1940's action/ adventure hero. Behold! Wicked huh/ I dig the Rocketeer slash Biggles kind of vibe this piece is throwing out, and find it makes World War II an era the fastest man alive really hits the ground running in. 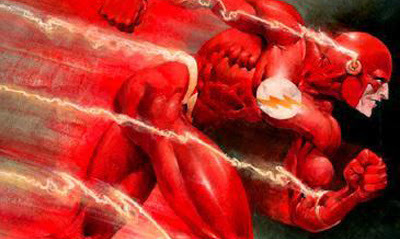 Says Chris of his own masterwork that was two years in the making "This is my take on a 40s version of The Flash. Didn't want to overdo it with very sci-fi gadgets, nano-fabrics or general high-tech neon-glowy-stuff. Wanted it to feel like a first trial run of the suit before it became the red/yellow spandex suit it is today." What do you think? As I begin my "Reasons Why The Flash Needs A Mohawk" written petition to DC Entertainment, you can sound off on the design below or visit Chris's online portfolio after the jump. I think it's pretty darn swell (is that 40's era compliment?) Minus the mohawk. Hey Kenan, welcome to IADW! Glad you liked Chris's art as much as I did. As for the mohawk think, looking back I think I've never met a mohawked character I didn't like... OMAC, Gladiator... and of course Storm. Mohawk Storm, now those were the days.